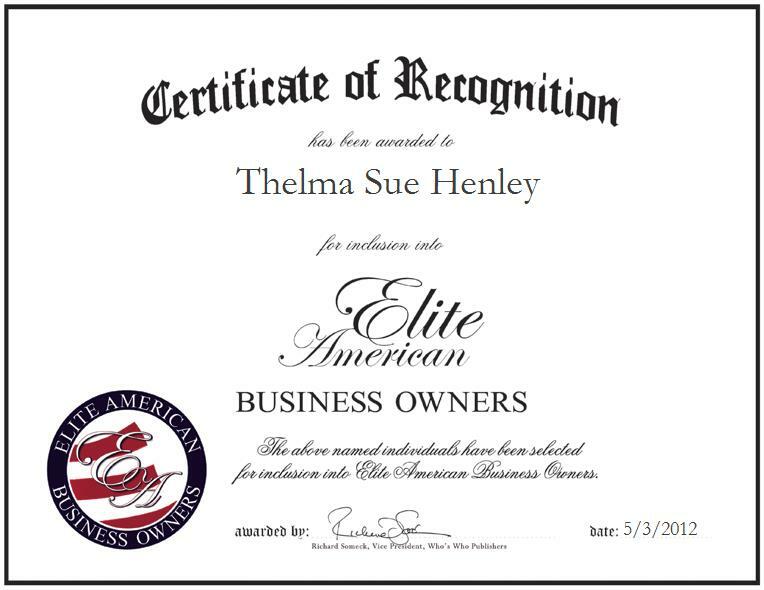 Thelma Sue Henley is the owner and operator of Henley Ranches, a cattle raising ranch based in Nocona, Texas. Ms. Henley has amassed more than three decades of professional experience, and over the course of her career, an ever-growing love of her work has continued to blossom. At the helm of her company, Ms. Henley is responsible for training horses, managing operations, raising and selling high-quality cattle, and ensuring proper maintenance of the ranch. Ms. Henley has garnered a reputation of prominence for her outstanding efforts as a business leader; she marks a major career highlight as her appearance on “Good Morning America” at the tender age of 16, and another as her being written about in the Wichita Falls Record News for breaking and training horses, which was a rarity for women during the 1960s. She went on to build on a diverse skill set, serving as a card dealer at the Royal Inn, Desert Inn and Riviera in Las Vegas. She served as an assistant rancher at various cattle ranches throughout Nevada, and taught calculus, trigonometry and geometry in the Dallas School System.